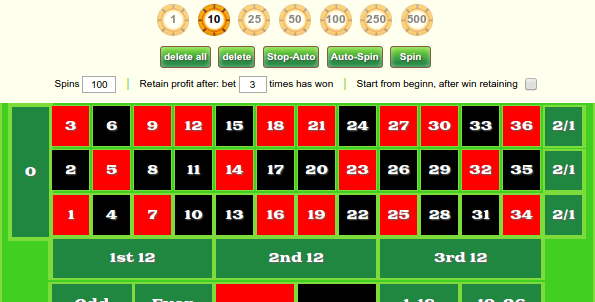 Play Free Online Roulette for Fun and Research. 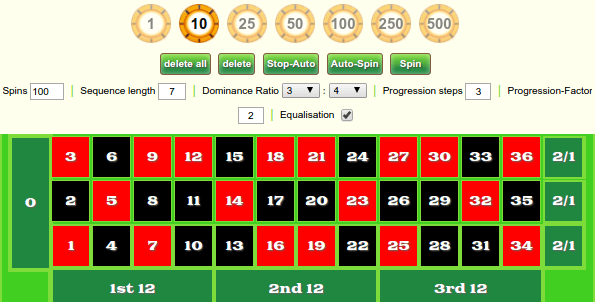 All our roulette games generate their random numbers with modern random algorithms and deal with points only. 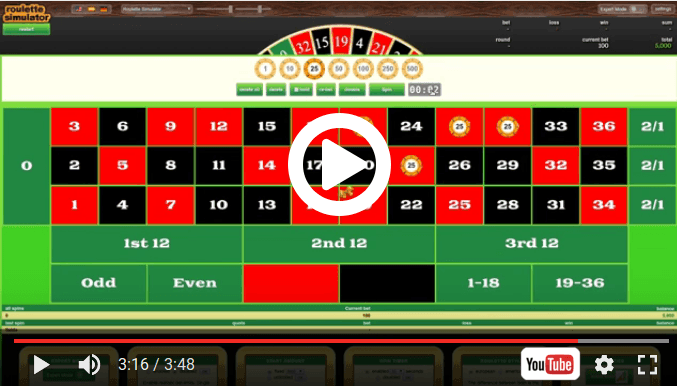 With our virtual roulette wheels you have the ideal interactive online tools for learning and understanding how to win and lose at roulette. All who want to show up their skills are invited to our Rated Game where roulette enthusiasts from all over the world compare their results. Have fun! With our free roulette simulators you can learn and understand the aspects of probability, logic, rules and strategy without any financial risk. We offer the games for fun and research. They are free to use. Roulette is considered as a fair game of luck because the course and the outcome depends solely on randomness. A moderate house advantage for the game organizer lowers the chances of winning only slightly less than 50 percent. 18/37 - 48.65% in European Roulette and 18/38 - 47.37% in American roulette. 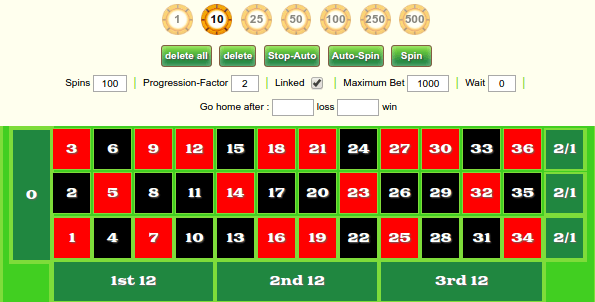 An experienced roulette player usually tries to bridge the house advantage by the aid of progression strategies. These strategies are well-known probabilistic theories that are described in more detail here. These concepts are, however, limited in their effectiveness, but give the strategist an advantage over the laity and seem to work for a certain period of time. The mathematician speaks of the law of large numbers, which a player can not escape because the large number is stronger and more powerful than a short-term deviation from the probable series. On the one hand it is argued again and again that due to randomness everything is possible, so also the absence of an event for a very long period of time. In practice, however, these periods are regularly terminated by the probable. While the roulette player has to decide on a prediction before the occurrence of a random event, the decision is made randomly. The roulette hardware must be designed in a way, that no prediction about the next event can be made. A random event can not be predicted. Nevertheless, we can look more closely at random events and make certain statements. It is certain that 1 event from 37 or 38 possible events will arrive. Our goal is to stand as a winner in as many of these events as possible. Roulette exists since the 18th century in France and became more popular in the 19th century in Italy, Germany, UK and in the first part of 20th century in US. 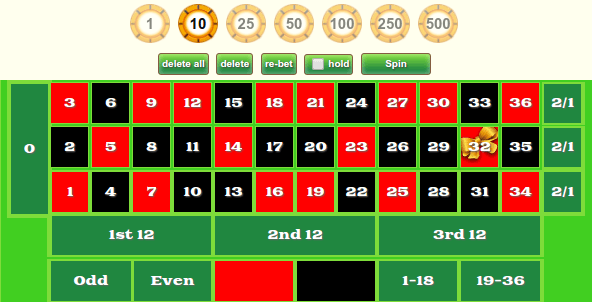 Nowadays Roulette is famous in most countries of the world. The invention of the Roulette Wheel was not intented to create a device for one of the most loved games of gambling. Instead it was thought as wheel of numbers wich solidly creates random numbers in a mechanical way and offers the possibility for studying random distributions. There is no proof about the exact age of the roulette wheel. In some sources Blaise Pascal is credited as the inventor, others claim that european trades found the idea of numbered wheels in China and imported it to Europe. Gambling in general is considered dangerous when players in precarious situations risk their financial integrity. Gaming on money has always the potential to cause big suffer. Most people usually don't know when to stop. Even if a roulette match goes well and a player could leave the session with e.g. nice 50% profit, in 90 precent of the cases our player will try to get to 100%, and after that the 200. But it ends most of the times in a total loss of the inital bankroll. On the other hand we have real chances for a good coup. 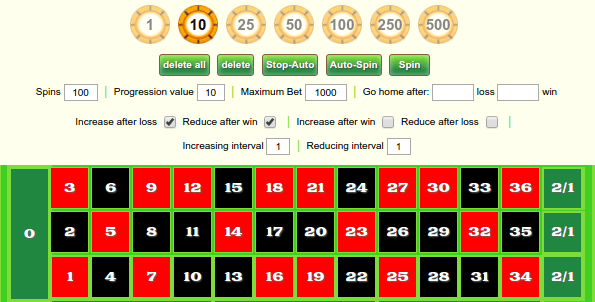 You can read the precise numbered payment rates with explanations and calculation examples here: what are the odds of winning at roulette. 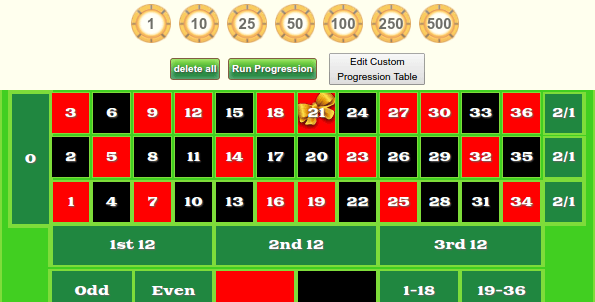 Many players share the experience that especially in the beginning of a roulette game their predictions are better. We call it FreshMenBonus. Our stats from the Rated Games also show that lots of lost games had massive peaks of profits before the match went down in the end. But the quality of an opportunity to realize is to leave the place and enjoy the success as soon as the opportunity has delivered. Here is the magic (unscientific) formula: If you feel personally good and you have that idea due to a special inspiration about the next falling number, you will probably hit one of them during the next few tries. If you have a good idea from the same quality right after the hit you can continue. If you have no clue about what could fall next you should stop.